Gentec Electro-Optics, Inc., will soon be launching a Laser Beam Profiling Camera with an Extra-Large Aperture of 20.5 x 20.5 mm. This incredible aperture is achieved with the use of an Optical Fiber Taper that is fixed on the optical sensor. The fiber taper concentrates the beam onto an 11.3 x 11.3 mm sensor, thus resulting in a multiplication factor of 1.8. All the necessary corrections are done by the software so the user doesn't have to calculate the corresponding beam size. 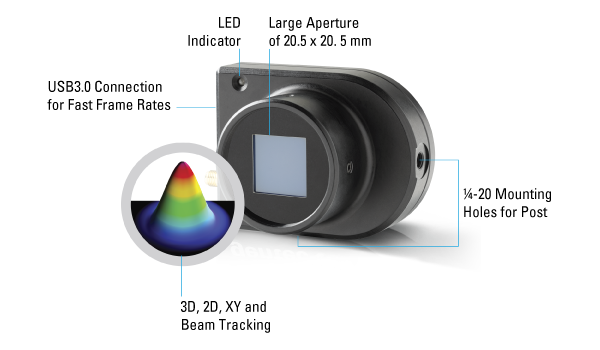 The Beamage-4M-FOCUS is perfect for the larger beams and eliminates the need to use complex re-imaging setups. The new Beamage-4M-FOCUS will be available in July 2016 but orders can be placed now. For more information, you can download the preliminary specifications sheet of this product.